Cost of capital ( k ) is the minimum rate of return that a firm must earn in order to satisfy the expectations of it’s investors. In other words, It is the minimum rate of return required on the investment projects to keep the market value per share unchanged. It can be distributed as dividend to shareholders. It can be reinvested for future returns. 2. 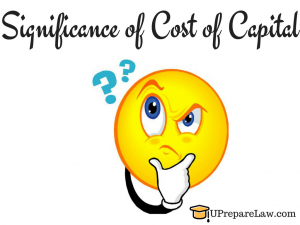 When Cost of Capital ( k ) is used as the discount rate in capital budgeting decisions, it helps to accept only those proposals where the rate of return is more than the cost of capital. 3. 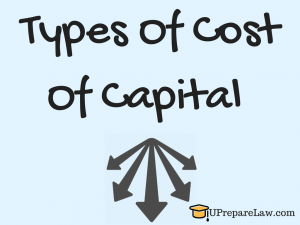 Cost of Capital ( k ) helps to decide the capital structure of the firm. The firm will select only those sources which have the minimum cost. So, the overall ( k ) will be minimum. 1. Risk free rate of interest ( I ) : It refers to the interest rate which is earned on the risk free or default free security. For Example : Reserve Bank of India. 2. Business Risk ( b ) : It refers to the potential of an organization to earn the returns which will satisfy it’s investors. 3. Financial Risk ( f ) : When the debt is present in capital structure, earnings after paying the interests should be enough to satisfy the investors. This risk is known as Financial Risk. 4. Other Considerations / Factors ( o ) : Factors like liquidity, Timing of returns, Shareholder’s preference, etc. also affects the cost of capital. where, k = Cost of Capital. I = Risk free rate of return. At a particular point of time, the firm might have raised funds from various sources, i.e., short term as well as long term. But, cost of capital is the combined cost of all the funds used by a firm. Funds come from a pool of sources. 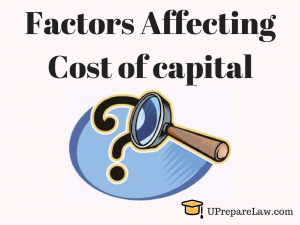 Specific cost of capital is the cost of a particular sources of funds while overall cost of capital is the combined cost ,i.e., cost of all sources of funds. Implicit Cost of Capital is the cost of retained earnings expressed in terms of opportunity cost which is associated with returns foregone on retained funds . In other words, Implicit cost of retained earnings is the return which could have been earned by the investor, had the profit been distributed to them. Explicit Cost of capital of a particular source may be defined in terms of interest or dividend that the firm have to pay to the supplier of the funds.